Rallies then, bicycles today. Always with the same drive: perfectionism. But how do you actually drive a Porsche perfectly – and fast? 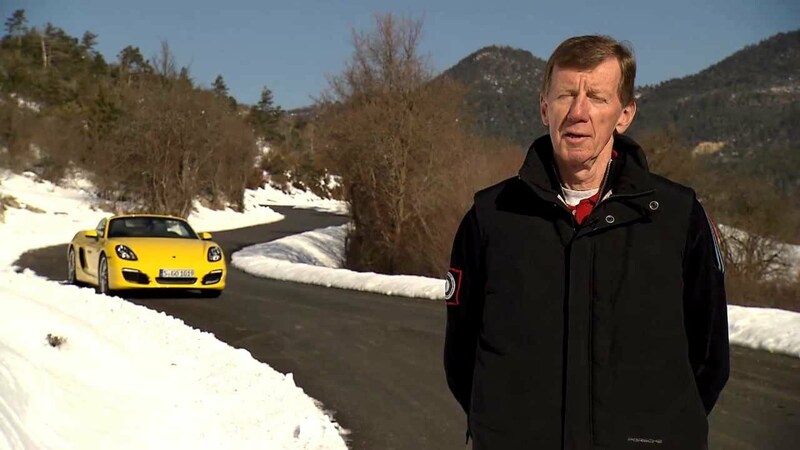 We asked Walter Rohrl. Who else. You are regarded as a figurehead for the Porsche myth and once said: "From the first kilometer, I felt nothing but enthusiasm for the 911." What makes the magic for you? There is no other car that applies force to the pavement as directly as the 911. Whether turning the steering wheel, accelerating or stepping on the brake – in the 911, I am always in direct contact with the road. You once said: "Porsche horsepower counts twice". What do you mean by that? The 180 horsepower of the Porsche 911 S were just there at that time. Without losses. Not like the Abruzzo ponies, but real horsepower – thanks to a rear engine without a propeller shaft and with terrific torque transmission. Even back then a Porsche with the same capacity as other cars always had more power. More than 20 years ago, Porsche campaigned for the 911 Carrera with the words: "For 100 years, cars equaled independence. Only one equals addiction." What car did you first become addicted to? Your 356 that you bought when you were 21? Yes, for me there was never another car. Even as a twelve-year-old, I knew that I would save until I could afford a 356. Until then, my brother always had to give me a ride in his 356. Which car do you know best? The 911. Especially at the limits, because there it demands sensitivity and your undivided attention. Otherwise you quickly become nothing more than a passenger. And in which car do you prefer to take detours on the way home? In the Porsche GT3. I generally like to take detours, because I hate sitting on the freeway in traffic. But even in my old 1973 911 2.7, it’s great fun. It doesn’t feel like I’m halfway imprisoned – like with some modern cars. Is it the accurate-to-the-millimeter controllability that makes a Porsche a special car? Yes. A Porsche goes exactly where I steer it. Completely unfiltered. About driving a racing Porsche, you once said, more or less: "Either you can do it or you can’t." So it cannot be learned then? Definitely not, you really need a considerable amount of talent. If the engine is at the rear and the weight distribution is unequal, controlled driving requires intuitive sensitivity. Anyone can drive a series Porsche. How is a 911 different from a Porsche race car? A series 911 is much more forgiving at the limit. It shows you the limits and the electronics help you not to cross it. What do you think, is it possible to control the original 911 Turbo despite the turbo lag? The original turbo is a car for men, not for boys. It is possible, but I would estimate that only ten percent of its owners truly control it at the limits. The standing pedals in Porsche classic cars might need some getting used to for many. What is important for a newbie to note? A newbie will only notice them right after getting in. Three days later, he will be used to them. And years later, he will appreciate that they let you brake and double-clutch perfectly. Speed and perfection go hand in hand with you. What do you advise everyday Porsche drivers? Better to focus on perfection than pace? Perfection, clearly. The pace comes by itself. And never forget: entering the curve is the slowest point. After that, all you have to do is counter-steer and steadily accelerate from the middle. Just make sure you don’t enter the curve too fast. It’s all a matter of timing. You have driven countless cars in the red zone with hard bursts of acceleration. Is this the true art of rally driving? How to steer with the gas pedal? This is certainly an art, but actually it’s totally logical: I make the transition from stable to unstable driving by load changes. Which in turn means I drive fast up to the curve, ease off the gas in time and use targeted bursts of acceleration to keep the car in the drifting phase. The main thing is not to drive against the front axle. How do you drive against the front axle? By entering the curve too fast in search of the ideal line, then counter-steering too far and losing traction. Smooth driving is better than hard driving. Your driving style is considered to be very controlled and com- posed. How would you describe it yourself? Very minimalist. My secret: steer sparsely, steer softly, steer early. And from the middle of the curve, open up the steering. I drive sporty, safe and focused – it keeps you mentally fit, too, when you are focused on the task. As a Porsche representative, you still participate in rallies. The objective there is regularity and absolute control of the vehicle – not speed. How much does your ambition run away with you here? Honestly not at all. I just enjoy being able to drive beautiful old cars. You have repeatedly taken the ’70 Porsche 911 ST to the limits of what is possible – and yet were in control at all times. What was key when you initiated a high-speed drift in this car? It was always vital at high speeds to feel every movement of the car, to counter-steer at the right angle and to open up the steering in time. In the rain, it was necessary to maintain control and to come off the drift onto the straightaway smoothly. Either you have a sense for it or you don’t. Your favorite 911 was your rally car of the 70s Bavaria Rally: a 911 2.0 S from 1967. What made it your favorite 911? That it completely and totally applied its force to the ground. And that its short wheelbase made it so tricky to maneuver. What used to be the fundamental equipment of the 911 driver? A good amount of respect and a willingness to be focused on the task at hand at all times. What do you pack today – other than time for detours? Still respect, but now especially for the high speeds that can be reached so easily today and are no longer noticeable, because everything is so perfect in the 911. Each new 911 generation is superior to its predecessor. Will there ever be any limits? If so, in what way? I’ve heard that even you now use the brake when bike racing and have stopped speeding down the mountain at a 100 km/h. Have you slowed down? Previously, my speedometer went to 99.9 km/h. After that, it started blinking. My goal was always to come down the mountain blinking. Today I’ve slowed down a lot and prefer my mountain bike. On the road bike, even at 80 km/h I would be worrying about a flat tire or the odd high center of gravity of a cyclist. And when I do get on the road bike to ride the 73 km to Regensburg, then I dress up like a parrot. My fear of not being seen by a driver is greater than my vanity. You once called Niki Lauda "a genius on wheels". Who would you call that today? The motorcycle racer Marc Márquez. In everything you do, time plays a role. You are always looking at your watch. Have you still not arrived? Yes, that’s true, unfortunately. I’m trying to wean myself off of it. When I am fighting up a mountain on my bike, the first thing I do when I get to the top is look at my watch. Only then can I be happy. Which is total nonsense, I could already be satisfied halfway up. I’m working on it. And now we stop: 38 minutes and 47 seconds. Thank you for your time, Walter Rohrl. New tires are now available for nearly every Porsche model up to fifty years old.